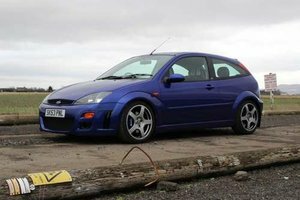 We are delighted to welcome back this Mk1 Focus RS having supplied this vehicle to a collector a number of years ago – Build number 0190, a well known multiple Concours winning vehicle. Anybody who is familiar with this vehicle will know that it is without doubt, the best example on the market, and quite possibly one of the best example in the country – 15x Concours winner speaks for itself. 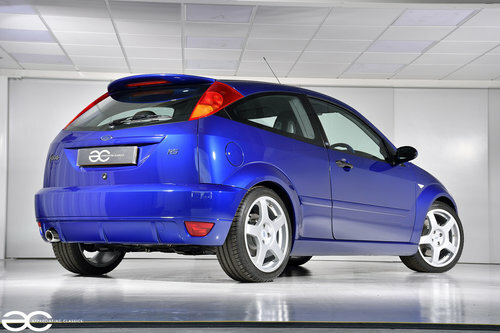 Mk1 Focus RS’s are becoming increasingly hard to find in this condition, do not miss out…. 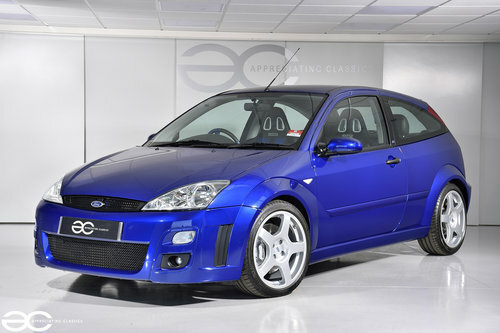 if you are looking for a Mk1 Focus Rs to add to your collection, this is the car for you! 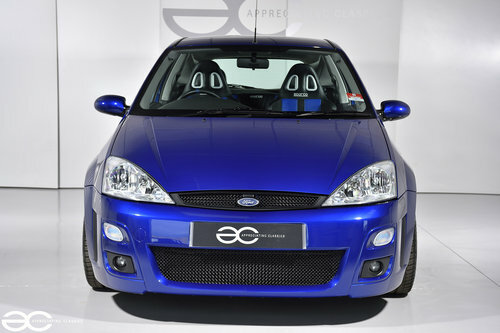 Originally supplied by Ford Dealer – Peter Stirland Limited on the 21st of December 2002. 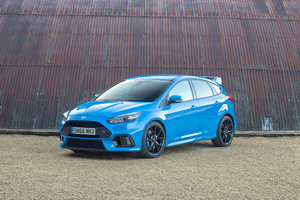 Full traceability of previous owners is within the comprehensive history file, all of whom have been Ford RS enthusiasts, and all of whom have cared for the vehicle greatly. All original booklets are present, in the original leather RS wallet. Service book is of course present, and is showing 9 stamps. 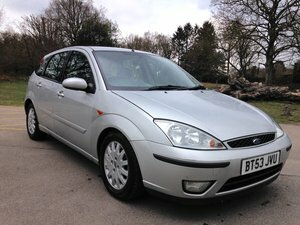 Many receipts for the various services which have been carried out, along with MOT’s to warrant the very low mileage, along with Sorn declaration letters. Original V5, along with various RS Owners Club memorabilia, and of course the original spare key is present. Alongside the substantial history, is a list of each Concours win. 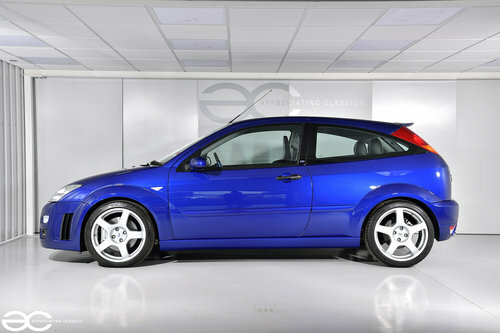 A car for the true enthusiast collector. 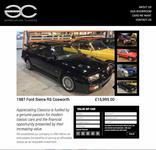 Original paintwork throughout, all of which is in fantastic condition. All paintwork has been measured with a paint depth gauge and confirmed to all be matching and original. The paint has a superb shine, and has clearly been very well cared for throughout its life, with no marks, dents, scratches, or even any swirl marks from cleaning. All panels are of course original, including all trims. Everything about this car is stunning, all lights, badges and glass are exactly as they were on the day it rolled off the production line. 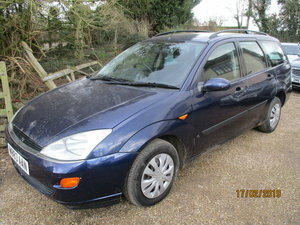 The car has been treated to the professional application of Armourfend at a cost of over £525.00. The Armourfend has been applied extremely well, and is not noticeable until pointed out. Exceptional condition inside, as you would expect. Original RS floor mats are still fitted, and in great condition. The ‘unstitched’ seat bases are still in superb order, showing barely any wear on the drivers seat at all. All switches and dials are without any damage, and all work just as they should do. As per the rest of the car, the interior remains completely original, with the factory fitted stereo and speakers still in place. All the blue leather is still very vibrant, and without damage. The steering wheel and gear knob are still as new, even the pedal rubbers look as though they have never been used. 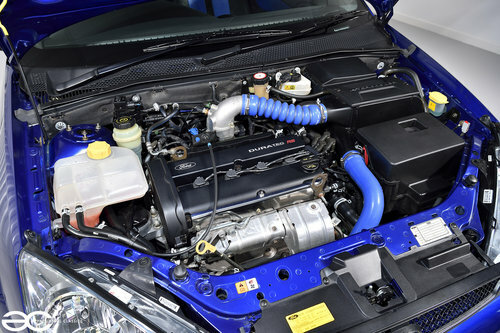 As can be seen from the pictures, the engine bay presents very well, being in unmodified and ‘as new’ condition. The engine runs beautifully, with no taps from cold, or indeed once up to temperature. No smoking is present, either on start up, idle, on boost or off overrun. 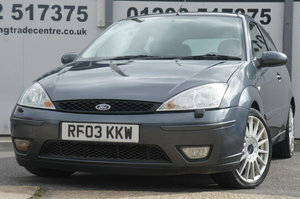 The engine runs just as Ford intended and gives healthy performance through the rev range with no hesitations. All running gear is in great order. 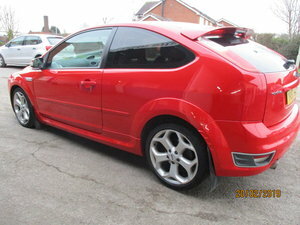 Drives perfectly, nice and tight with great braking power, and is without any noises at all. All running gear is still as new, with no corrosion, all still in original finish with original factory marking paints. Even the brake disc centres have the original paint finish with no corrosion, rear brake caliper’s are unpainted as per brand new without any defects. Front brake caliper’s are original paint and superb order, with only the nearside having a tiny chip in the paint which only the very keenest eye would notice. The underside of this car, along with the running gear, is genuinely as good as the top side, and this is largely how it has won Concours 15 times. 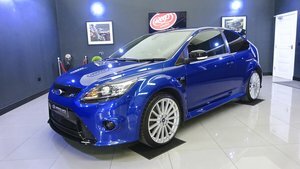 Ford Focus RS 500 Only 500 produced Delivered new at Luxemburg. 1st owner, and only 400 original km.